Not only do I think this bike is the cutest ever and I would love to ride this around with my family but I think bike riding is a great way to keep active and fit with your family! 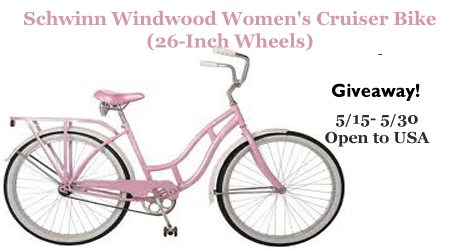 The classic Schwinn Windwood women's 26-Inch cruiser evokes the simple style and grace of traditional bicycles, making it a great choice for cruising to the store, the beach, or around town. 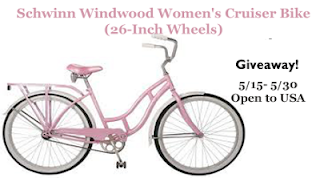 Designed for easy, relaxed riding, the Windwood boasts a sturdy steel frame with a low stand-over height, making it easy to get on and off the bike. The rustproof 26-hole alloy rims and rear coaster brakes, meanwhile, allow you to stop on a dime. And riders will love the classic chrome fenders and rear storage rack. Other details include a comfortable wide-spring saddle, a single-speed design, pneumatic tires, and curved back handlebars. About Schwinn Founded in 1895, Schwinn is an American icon that's long been synonymous with quality and innovation. The company has built some of the best-known and best-loved bikes of multiple generations, including the Aerocycle, Paramount, Phantom, Varsity, Sting-Ray, Krate, and Homegrown. Today, Schwinn continues to innovate with such releases as the redesigned Sting-Ray, Rocket mountain bikes, and Fastback road bikes. With a continued dedication to quality forever synonymous with the Schwinn name, America's most famous bicycle brand looks forward to providing another century of innovation, freedom, and performance to people of all ages. 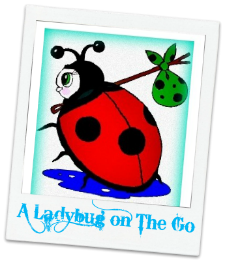 It would be nice to get more exercise,,I hike a lot but after a while you want to do different things! It would be fun to ride. I've been considering getting a bike, and I don't really go for some styles but like this one. Plus it's free! Thanks for the awesome giveaway! My family and I have wanted to start biking together on the weekends but the Mr and I don't have bikes so this would be a great start to get us out together! I bet our three big dogs would enjoy it too!! i would love to ride bikes as a family! i would love to ride with my family!